The Short Version: In 1990, Cassie Zampa-Keim left college due to illness and began focusing on what really mattered to her in life: building loving relationships. She became a professional dating consultant in her early 20s and found she had a knack for encouraging singles of a certain age. In 2010, Cassie founded Innovative Match, a full-service dating company, to combine relationship coaching with a matchmaking database so senior singles nationwide never have to tackle the dating world alone. Today, Innovative Match connects and supports thousands of educated singles over the age of 45. The company’s concierge services include online dating assistance, stylist makeovers, personalized coaching, and elite match suggestions. You can join the Innovative Match community to have seasoned professionals help in your search for a long-lasting love in a fast-paced world. At the age of 20, Cassie Zampa-Keim was diagnosed with stage-three cancer, and her entire world changed. She left school in Southern California to focus on her health and re-evaluate what she wanted to do with her life. That’s when she fell into the matchmaking industry. As luck would have it, Cassie’s high school best friend’s mother was just starting a matchmaking firm and was looking for someone to help with the operation. It seemed like the perfect fit because Cassie’s illness had made her realize how important personal relationships are in life. She found fulfillment through working with single people, especially the older men and women who shared her love-oriented perspective on life. And her health improved dramatically. 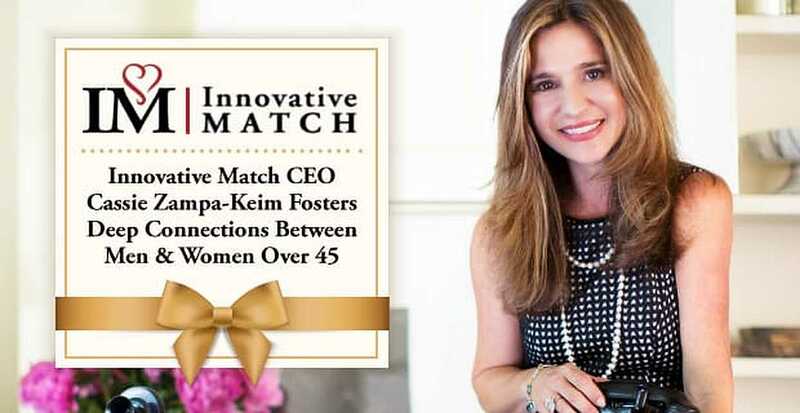 CEO Cassie Zampa-Keim founded Innovative Match to bring more love into the world. Cassie said she was one of first professionals to work in the matchmaking business and has spent the last few decades developing services to better serve modern daters. In 2010, she established Innovative Match, a full-service relationship coaching company that caters to daters over 45. As a matchmaker, Cassie seeks to play an instrumental role in people’s overall health and happiness. She’s not just connecting people on dates — she’s helping them get in relationships and enjoy longer and more fulfilling lives. Innovative Match specializes in helping clients over the age of 45 adapt to the modern dating scene. The firm is innovative because it blends dating coaching with traditional matchmaking, offering valuable dating assistance both online and in person. Cassie’s typical client is financially secure and interested in finding a committed relationship through a high-end service. Cassie said she works with people from coast to coast and does whatever it takes to guide them to love. Innovative Match supports and introduces a vetted community of singles over 45. The insider memberships include one-on-one coaching sessions as well as personalized introductions and online searches in Innovative Match’s private singles database. The firm’s professionals give clients a quick makeover, pass along a few dating tips, and then point them toward worldly and elite dates with similar life experiences. You can also get online dating feedback and management from experts who know what it takes to attract someone on a dating website. 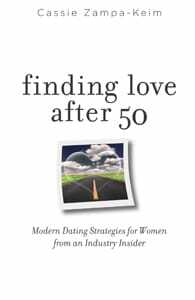 Published in 2016, Cassie’s book “Finding Love After 50” details modern dating strategies for single women in search of genuine connections. If you’re tired of endless swiping, you can pick up her book to learn how to make online dating work for you. “Finding Love After 50” outlines smart strategies to attract romance online. Cassie said she believes online dating has significantly improved the dating landscape for daters of a certain age — but they don’t always know how to take advantage of all the high-tech tools at their disposal. “Finding Love After 50” provides a step-by-step guide for anyone navigating online dating for the first time. The book also reviews in-person dating strategies for anyone who wants to go old-school and flirt face to face. Though only six chapters long, “Finding Love After 50” provides an in-depth assessment of where and how to meet eligible dates so single women can enjoy the dating process and get results. By making her expertise accessible to all, Cassie empowers readers to direct the course of their love lives and make informed decisions that will lead them to the relationships they desire. Cassie has spent decades in the dating industry and has seen countless couples ride off into the sunset together thanks to her personal introductions and coaching. Carrying on the same record of success, Innovative Match has collected glowing testimonials from clients who found each other thanks to the concierge team’s efforts. In 2017, three of Cassie’s former clients got married. One of those couples met on Match.com and only went on a second date because Cassie messaged the man on her client’s behalf and urged him to ask the single woman out again — even though she had said no already. Cassie promised that her client would agree to a second date if he asked her again. He did, and she did, and now they’re happily married. Cassie’s battle with cancer in her early 20s was a real wake-up call for her. Her sickness made her realize what was truly important in her life — her relationships. That realization led her to a career in matchmaking and dating coaching. Today, Cassie has made a profession out of bringing love into people’s lives, and she couldn’t be happier with how everything worked out. Cassie founded Innovative Match in 2010 to give mature daters a streamlined and structured pathway to love. The boutique dating company offers personalized coaching for online and offline daters seeking exclusive date opportunities. If you’re over 45, you can join the community to learn how modern dating tools can improve your love life and boost your self-esteem.